During my journey in Moscow, in April 2008, I visited the Energia museum. This museum is located in the NPO Energia company (main constructor in Russia) in the suburbs of Moscow (Korolev city). This company was created after the fusion of two of the main design bureaus of rockets and rocket’s engines, the OKB 1 of Korolev and the OKB 456 of Glushko. In 1974 after the cancelation of the lunar space program the authorities decided to melt those two design bureaus under a new one NPO Energia. The first general director was Valentin Glushko from 1974 to 1989. On his desk are exhibited his work things, his slide-rule (german), his pens, his keys which the key office is notched to help him recognised it in his pocket. The next room is dedicated to the awards of the company. During the crise of the post-soviet years, NPO Energia should diversify itself to survive, it sold vacuum cleaners and food processors. This vacuum cleaner is there to remember it. The most important part of the objects are in a big room (divided in two floors) which was renovated some years ago. It begins upstairs with some models and probes. Then on the ground floor there is spaceships like Vostok, Voskhod, Soyuz, Apollo and even some MIR moduls. It was the first artificial satellite of the Earth, launched the 4 October 1954 (Kazakhstan). Its bip-bip shaked the world and was the beginning of a new age. Middle picture: the centre volume is occupied by the battery cell, on the right we can see the fan which melt the air inside the pressurized volume. Right picture: sputnik’s radio receiver. Launched the 3 november 1957 with the dog Laika aboard. It became the first living creature to orbit around the Earth. It died only few hours after being put into orbit because of a failure of the thermal regulation system. It was the first scientific satellite of the USSR. Because it couldn’t have been finished for the launch of the 4 october 1957 it was launched seven months after on 15 may 1958. The instruments should have taken informations about the hight atmosphere density, cosmic rays, solar rays, the existence of high energy particules and micro meteors. But the main objectif of the mission was to study the Van Allen radiation belt, exposed by the american satellite Explorer 1. Left picture: we can see in the lower part, thermo-regulation panels, they open and close to let the heat go away or to keep it. Right picture: the most part of the volume is filled by conventional batteries. Luna 2 is the second Lunar probe launched the 12 september 1959. It crashed on the moon on 14 september. Scientifically Luna 2 is the first probe to prove the existence of the solar wind thanks to its ion detector. It also proved the absence of magnetic field and radiation belt around the moon. The Luna 3 probe is the first to take pictures of the far side of the moon between 4 and 22 october 1959. Launched the 31 january 1970 this probe is the first to achieve a soft landing on a celestial body and transmit pictures to Earth. The probe, of spherical shape, open itself like a flower thanks to its petals, which allows it to sit up in case it was upside down. Telescopic sticks spread with aluminium pieces at the bottom of strings. This device was set up, with the help of the 360Â° camera, to see if there was wind on the moon. The Elektron 1 and 2 satellites were launch by a Vostok rocket the 30 january 1964. It’s a new serie of scientific satellites which made to measure the Van Allen belt. The Venera 8 probe was launched on 27 mars 1972 to Venus. The descent module went into the Venusian atmosphere on 22 july 1972, it transmitted datas during 50min and 11s to the orbital probe before being destroyed by the really corrosive atmosphere. This is the first soviet spacecraft. It has a ejection seat to eject the cosmonaut at 7km of altitude. 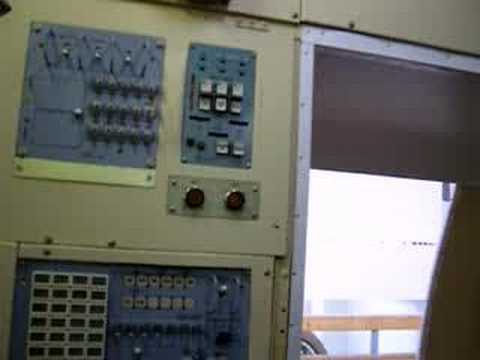 This choice was made because there was no landing retro-reocket (like on the Soyuz spacecraft) to absorb the negative acceleration during the landing. This fact will be hidden to the public for about 17 years from the Gagarin’s flight to ensure that the record was officially recognize by international authorities (indeed when a record has to be officially recognize the pilot has to remain in the machine until the landing). We can clearly see on the middle picture the metal straps that hold the service module and the descent module (sphere). Explosive bolts leave the two modules before the re-entry phase in the atmosphere’s dense layers. In case something goes wrong the heat can destroy those straps and free the descent module. The spacecraft of this dogs is a modified Vostok to bring the two capsules (like the one of Sptunik 2) for the two dogs. They were in orbit during one day before coming back on Earth the 19 august 1960. This was the first orbital flight that was able to bring back the passengers of a spacecraft. This is the spacecraft in what Yuri Gagarin made it’s historical flight around the Earth. Middle picture: Room for the parachute. Right picture: Connection system between the descent modul and the service module, we can clearly see the structure of honeycomb and the different layers of the heat shield. Ejection seat of Valentina Tereshkova (first woman to orbit around the Earth). The Voskhod spacecraft is a modification of the Vostok, because it can bring three cosmonauts. It was built to prove the Soviets were still in advance from the American and their Gemini program (two people in a modified Mercury capsule). For the second flight the spacecraft was modified to have an inflatable airlock. But, due to the risks of the mission the cosmonauts are just two and must wear a spacesuit. This is one of the seven airlocks built for the Voskhod 2 mission. SK-1: spacesuit used for the Vostok’s cosmonauts (Gagarin, Titov, Tereshkova,…). Sokol: spacesuit of the Soyuz cosmonauts. Suit for sea survival training. Orlan: spacesuit for extra vehicular activities. Right picture: micro meteors impacts on MIR’s solar panel. Left picture: details of the docking modul (Soyuz or Progress) of the Kvant modul. Right picture: details of the junction node. In 1975 took place the first collaboration mission between the USSR and the USA. This mission had no real scientific and technical purpose because all the major aspects were already mastered by the two countries (long duration mission, rendez-vous docking, …). The major point was the collaboration between two countries that were in cold war. Soviet engineers came to the USA and vice versa to work together and be sure that all systems were compatible. Soviet crew: Alexei Leonov, Valery Kubasov. American crew: Thomas Stafford, Vance DeVoe Brand, Donald Kent Slayton. A funny anecdote took place about the conception of the docking system. The two spacecrafts were equipped with male docking system but no one wanted to change its system to a female one. After long discutions the americans finally made an androgyn system (black module between the spacecrafts) so that the Soyuz can dock to it. Right picture: Androgyn junction system. Here is some models of the reusable Klipper spacecraft, developed by NPO Energia. Exactement comme les photos que vous voyez, je l’ai visité le 13/12/2010. Et merci pour les explications, javais oublié certaines choses. A treasure of high quality photos and information. Impressive craftsmanship in both models and museum.